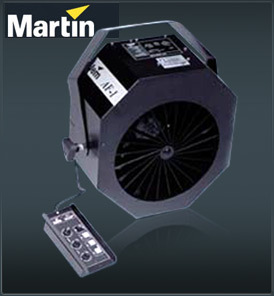 The Martin AF-1 Fan features DMX as standard and can be installed from the ceiling, in the truss, or can be floor standing. It incorporates a very high quality sealed fan motor designed to withstand high condensation levels associated with close proximity to smoke. Martin AF-1 Fan may be interfaced with ZR12 AL, ZR12 DMX, ZR22 STD, ZR22 DMX and Club Smoke System to allow simultaneous operation between fan and smoke. Can be used for converting a fogger into a hazer. When an Martin AF-1 Fan is used at high output in conjunction with a smoke machine at low output, a perfect haze effect can be produced. Low voltage hand held remote featuring auto timer and smoke level controls. Timer circuit features Jem’s unique 8X mode, which expands time capability of the standard timer settings by multiples of 8.